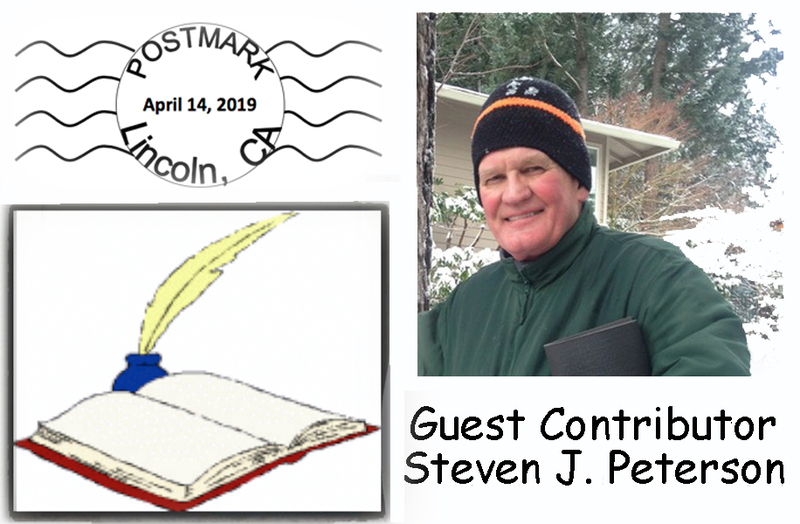 In response to our celebration of National Poetry Month and old friend, and former ConVivio contributor Steven J. Peterson, offers two of his favorite poems. Since I read your ConVivio post requesting poems, I have been thinking about poems that I like. I recalled that in the 1980s I read a lot of poetry, but have not read poetry with any consistency in the past twenty years. Makes me wonder how decades slip by so quickly. I recalled that when I was in high school I was charmed by Dylan Thomas’s “Fern Hill,” especially the opening line: “Now as I was young and easy under the apple boughs,” which made me think of the first “serious” play I attended at Moorhead (Minnesota) State College, these days called Minnesota State University at Moorhead (MSUM). The play was “Dylan” by Sidney Michaels, written in 1964. I saw it performed in April of 1966 near the end of my junior year of high school, about six weeks before my family moved from Minnesota to California. I thought it was a “great” play, but what did I know? I was two months away from my seventeenth birthday. I would like to see that play again. But never mind about that. On the day President Kennedy was assassinated. 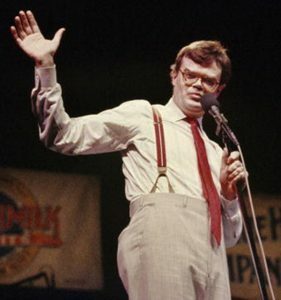 That was his public speaking metaphor. A shield against white blood cells. That’s what that guy was up to that day. A car slammed into a truck on a rainy highway. The truck guy was in satisfactory condition with neck pain. That’s where that guy was, and what he was doing. These kids broke into a junior high school. And smashed up an aquarium. That’s where they were and what they were doing. “Where They Were and What They Were Doing” by Matt Cook, from In the Small of My Backyard. © Manic D Press, 2002. Take a Peek on the lighter side of poetry. 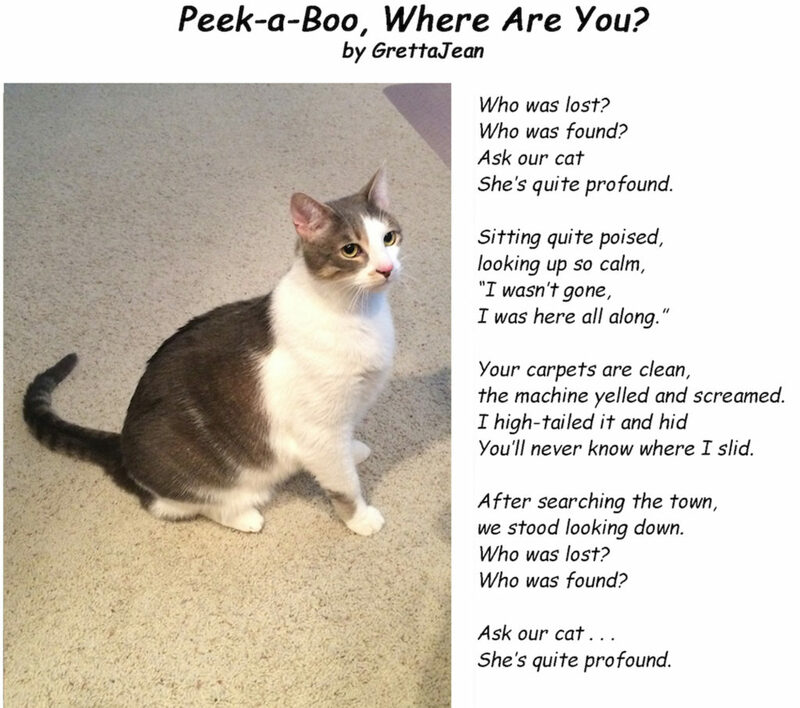 National Poetry Month with this poem. 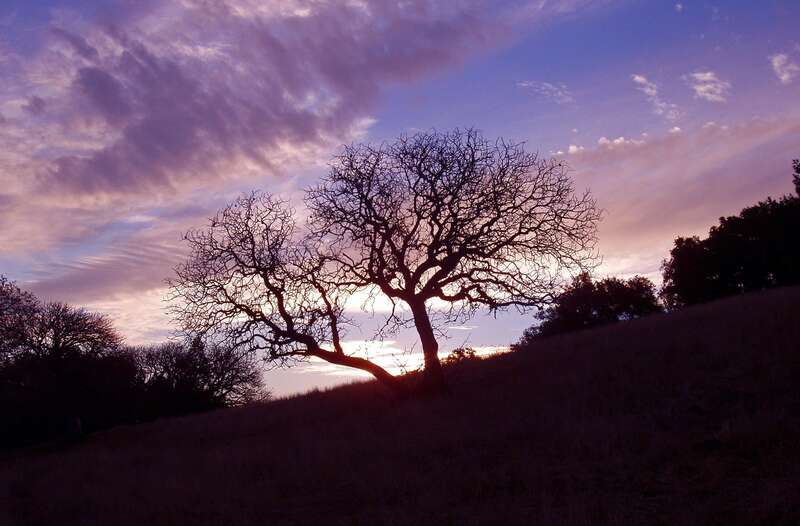 Once again, ConVivio celebrates National Poetry Month with a series of ‘poetic’ posts. 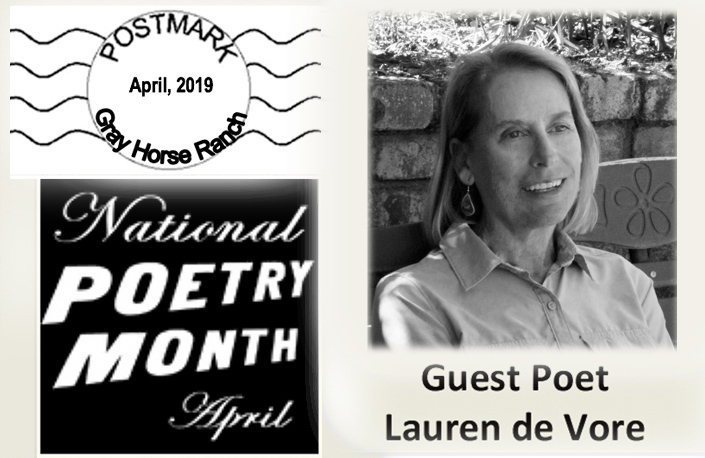 Today we are privileged to feature some recent poems by Lauren de Vore, a published Bay Area poet who has appeared on ConVivio a few times before as a Guest Poet. Each time hate and chaos trump what’s right? Brought it down hard on the paleo deer. Asking why, why do you do this to me? Because I have the club and you do not. And slashed it across the peasant’s face. Asking why do you do this to me? Because I’m of the purple and you are not. Asking why, what harm have I ever done you? Because I hold the weapon and you do not. And innocent eyes, the eyes of the beaten ask why. And you, poor soul, are not. For they are righteous and everyone else be damned. And hurls them down hard onto man below. Asks why, why do you do this to me? Else to the despots, seig heil! Driven forces beyond their control. Fraught with predators of every ilk. Going back is certain death. To guide them to safety. And when at last they arrive? Reverence and joy, festivals and delight. A-lone-all a-lone-all a-lone it repeated. And on the radio, it’s always past midnight. Past midnight on the radio. She wanders through the house, its lone occupant. Or shoe, but she closes the door and wanders on. Rushing this way and that at the top of their lungs. Took up with a new and improved model of wife. Is just the way she likes it. Only it’s not. A ghost. Maybe, she thinks, she should get a cat. On mem’ry I’ve got a firm grip. Lin Man Miranda is gold. So what is it gives me away? Does my voice quave some telltale tone? Of actual sine qua non age. And all will be cool, will be chill. But madam’d or ma’am’d I’ll be damned! Dorty Nowak is a writer and artist living in Paris and Berkeley who writes frequently about the challenges and delights of multi-cultural living. Among life-long achievements, she helped found the Oakland School for the Arts and contributes to artistic projects on two continents. 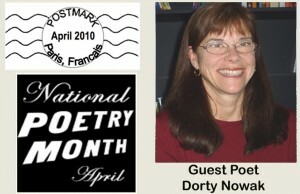 Dorty was ConVivio’s first ‘Guest Poet’ (has it really been) nine years ago. 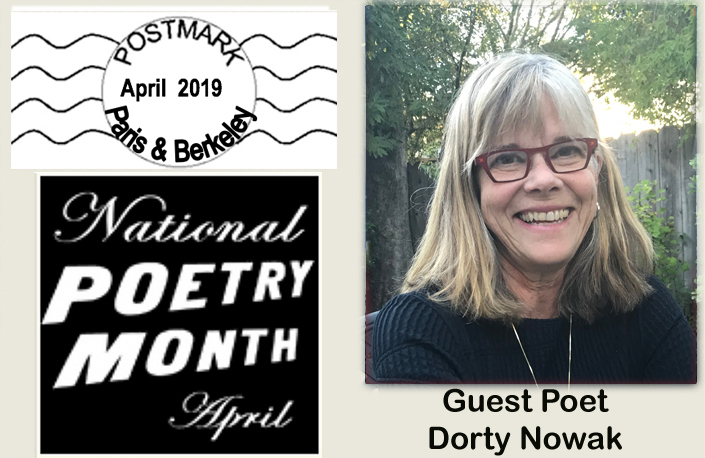 In celebration of National Poetry Month, Dorty Nowak returns to ConVivio and offers the following poems by “two of the greatest in the English language.” She observes that “old age and death have long been fertile subjects for poets, among them T.S. Eliot and Dylan Thomas.” In that category, she offers Eliot’s “The Love Song of J. Alfred Prufrock” and “Do Not Go Gentle Into That Good Night” by Dylan Thomas. And, as she has said before, “because I’ll never pass up a chance for extra credit” she gives us one of her own creations. three-linked mirrors tall as sails. Flayed by a country doctor when I was thirty-three. I cradle its weight in my hand. You ask to keep it, a bit of ballast. In the last drawer, two boxes of dime store jewels, gifts from music students. I run beads smooth as seaweed through my fingers, dangle jeweled earrings. Their cast-off colors dance on the surface of the pale green spread. You know the name of each child. The boxes, and their names, go with you. Only the piano is left, shipped from Austria, a gift from your father when you were six. 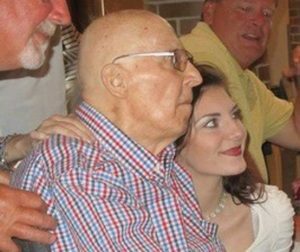 Grand vessel you commanded through two wars, both a brother and husband disabled young. Sorrows you never spoke flowed from your fingers. Nana, what shall I do with the piano? ——-> Since ‘National Poetry Month’ is . . . well . 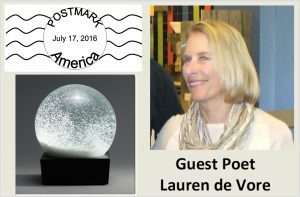 . . a month long, next week we will be privileged to have an offering from another of our previous ‘Guest Poets’ — Lauren de Vore. Look for that. Others are in the works — we’ll have to wait and see what appears! Dorty and Lauren and I hope that others (YES, YOU!) will take advantage of the opportunity to contribute some of your favorites— either poems written by others or their own creations. Go For It! There’s a whole month left of National Poetry Month! What are you waiting for? 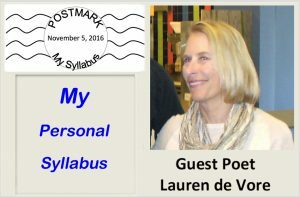 When I read The New York Times recent Op-Ed piece, “My Syllabus, My Self,” by Christy Wampole, I was caught by her premise that a syllabus is more than a reading list, that it’s “a personal and political statement.” I wondered, what would I include in a personal syllabus? Could I reach back across the years and identify the books and other pieces that have influenced me, that have shaped me? Could I put together a list such that someone who read those pieces could gain an understanding of me beyond what I put forward for the world to see? Although there are myriad other “influencers” that have contributed to making me “me,” from music and artwork to movies, seminal events and remarkable people, for the purposes of this exercise, I limited myself to written pieces. In putting together my syllabus, the hard part was (1) separating favorite pieces from those that influenced me and then (2) trimming the list to a reasonable length. I kept thinking, “Oh, I should add that…and that…and that…” In the end, I offer a dozen or so poems and quotes and another dozen or so books. The first four (the Milton, Wilcox, Guest, and Whittier pieces) were regularly quoted from during my growing-up years; the others I collected along the way in the decades that followed. You probably already know some of these; for the others, who knows, you may be intrigued enough to go look them up. Than I’m bluster and bluff and empty show. And I know what others may never know. A real eye-opener for an 11-year-old white girl living in suburban California. Striving , ever striving to achieve unfulfillable aspirations (for love, connection, belonging, etc.) yet failing due to personal foibles or weaknesses—an everyman version of the classic hero myth. 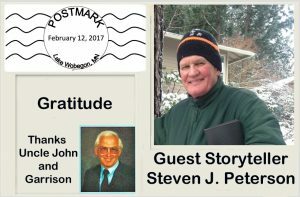 “The Gift”: The hazard of loving…as soon as you admit you want something or care for somebody or something, it’s taken from you. “The Promise”: Be very careful what you wish for; it often comes in ways you didn’t expect and with a cost far higher than you anticipated. “Junius Maltby”: The soul-crushing effect of accepting another’s view of yourself instead of your own, of following the dictates of convention instead of being true to yourself. Newspeak, the fragility and strength of language, the idea that by eliminating words, their very concepts can be eliminated—particularly relevant vis a vis today’s thin skins combined with the current intolerant obsession with political correctness. The great gamble—believe/live as if God exists and he does, you have gained everything; believe and he doesn’t exist, you have lost nothing… I vehemently disagree—you have lost dreadfully if you have not valued this life and lived it fully. Don’t piss off the gods. I read the news this morning. Yet another shooting, this time, police ambushed in Baton Rouge. Even as my heart wrenched, my cynical (benumbed?) mind wondered what it would be tomorrow—civilian or law enforcement? terrorist or home-grown? individual or mass? As horrid as these events are, we must bear witness to them. We must talk. We must act. Otherwise, nothing changes. Does it matter which is first? Does it matter who bleeds first? Yet again a life is ended. Yet again the globe’s upended. 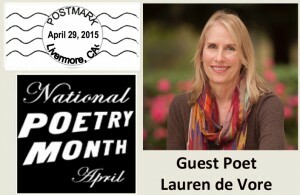 Guest Poet: Lauren de Vore, National Poetry Month 2015 Continues . . .
Well, this is a completely new experience for me, a coming out of my poet’s closet so to speak. After spending my working years as a science writer/technical editor, it’s a real treat now to spend time writing what I want to write! To my surprise, I find myself writing poetry. I’ve always loved the sound and rhythm of words, and some of my earliest memories are of being read to—fairy tales, classic children’s stories, and poems, lots and lots of poems. Remember “Lines on the Antiquity of Microbes” (subtitled “Fleas” by Strickland Gillilan): “Adam/Had ‘em.”, reputedly the shortest poem ever published? Or how about the hypnotic verses of Robert Service: “There are strange things done in the midnight sun by the men who moil for gold…”? As I found pleasure in the writing of the following poems, I hope you find pleasure reading them. 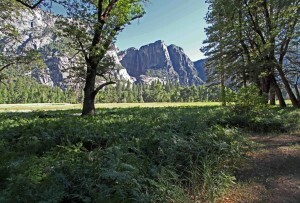 Like Dan, I love Yosemite. 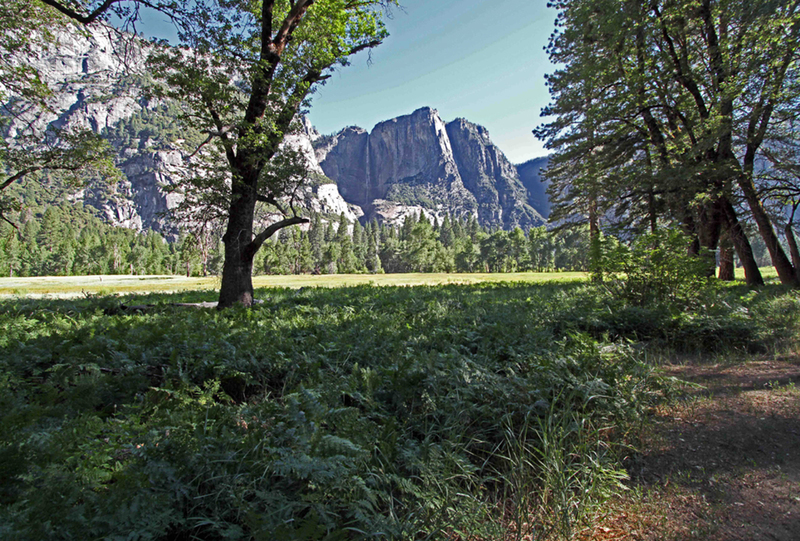 As spectacular as spring and early summer can be, fall is actually my favorite time there; the days are still warm but the nights are crisp and, with the crowds gone, the valley is quietly settling down for the winter. 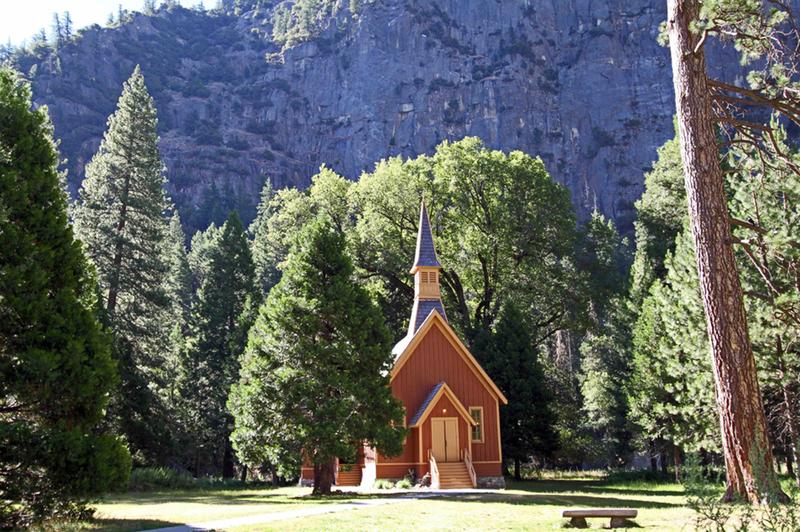 Regardless of season, there is something spiritual about the place. I wrote the following poem last June after an early morning walk. A way to leave the world better, if only a bit, than before. But cried also over the beauty and sheer joy of it all. But more are the times I did. A smattering of follies and kindnesses, of ordinary tragedies and triumphs. But I have lived. I am here. And shelved long since by those more scholarly. To me, and in the process pen my poems. But that one thinks and ventures to expound. Standing in the shower, hot water streaming over my shoulders, is often a creative time for me. Possibilities for new poems emerge, solutions to difficulties with in-progress poems arise. But then, dripping wet, I have to quickly find something to scribble on before the ideas evaporate with the steam! It back while laughing from the mountaintops. Me up and sets thoughts spinning in my head. Like smoke rings that shine brightly then take flight. The poem belongs to me and not the muse. Words are like people. Some are practical and purposeful. Some are demanding and ambitious or exuberant and frivolous. Others are somber and melancholy or perhaps persnickety and precise. And playing with them is just plain fun. Is chance to reacquaint myself with long-lost friends. An art, a mental exercise, a game of tones. That daunt for fear their inept use engender groans. That else would molder on some dusty reference shelf. And friendship true perdures despite mere fads and trends. I was always the nerdy kid, the one with glasses and braces who actually liked school and read poetry even when it wasn’t assigned. In fact, one of my favorite poems was (and still is) Robert Browning’s “The Bishop Orders his Tomb at Saint Praxed’s Church” (http://www.poetryfoundation.org/poem/173002). On a recent rereading, it struck me how much one’s enjoyment of such poems depends on knowledge of the “cultural literacy” of the era in which the poem was written. The verse below attempts to reflect on this realization. All but the super-erudite and scholarly. Their deeds are lost to time, their names are powerless. Ahead when poet too is part of history? And worth remembering, the rest to jettison. And hist’ry books though filled with facts are dreary works. And oft the parables evolve to something more. For they may well have powers far beyond your ken. These next two poems started out simply as observations of scenes but evolved into something a bit more. On high I watch the breakers pound the shore. But screaming gulls and one lone cypress tree. Beyond the known and venture ever on. They tarry not as onwards they are drawn. Now that the questing’s done, the limit’s reached? Refusing to accept that journeys end. 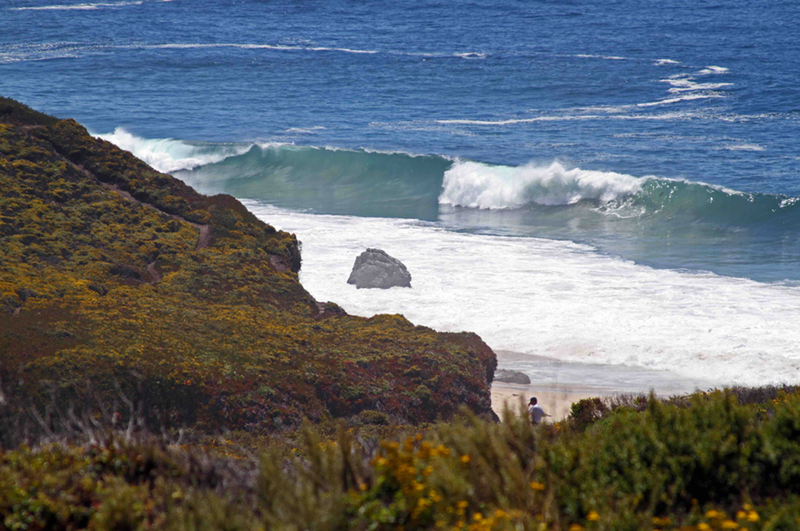 And know the waves will pound forevermore. 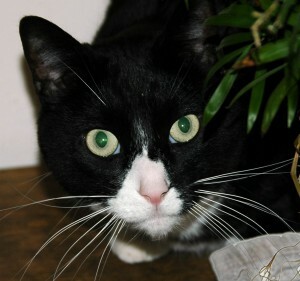 I’m convinced that all cats, just before they are born, are sworn to secrecy about all things feline! As gods, were worshipped, idolized, their favors wooed? Can you tap mem’ries from the days beyond recall? Of all that’s feline, foreign and thus hid from me? The swirling fire, so sits my sleek and silent cat. Every writer is, I suspect, an avid reader—a good thing too, since where would writers be without readers? My reading time is precious time, my selfish time. It’s good—it is, I wouldn’t read it otherwise. Again the present day and ever-patient spouse. Shatters the fragile shell of dawn. Dorty Nowak is a writer and artist living in Paris and Berkeley who writes frequently about the challenges and delights of multi-cultural living. A former educator and insurance executive, she helped found the Oakland School for the Arts. She is currently developing a collaborative project, ”Where Do I Belong,” involving artists and poets from Europe, Australia, and the U.S. 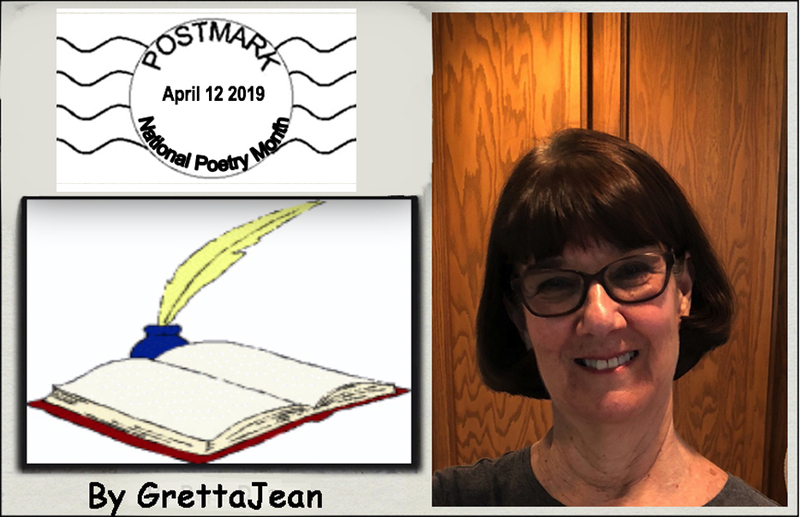 In response to our recent ‘National Poetry Month’ post, Dorty offers a couple of her favorites by Richard Wilbur and Wallace Stevens; and, she says, “because I’ll never pass up a chance for extra credit” she gives us two of her own creations. To introduce her own poems, “Windsurfer“ and “Haiku“ (below), she writes: “Recently I have been experimenting with various poetic forms. I particularly like haiku because the form demands a deceptive simplicity. I wrote “Windsurfers” while sitting on a beach in Mexico last year watching my friends windsurf. I was captivated by their skill and beauty.” — Dorty. Since ‘National Poetry Month’ is . . . well . . . a month long, she hopes others will take this opportunity to contribute some of their favorites. Hold their wings against the pull of wind. Their colors flashing in the sun. They swoop and flit to quilt the waves. They seem, if only for a moment, to fly. To transform them as they play. As always, your comments are always welcome and we would still like to see more of your favorite poems in this space. 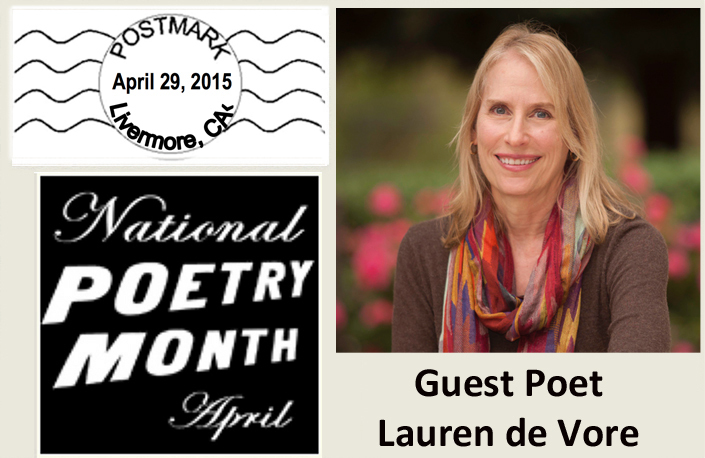 There are still three full weeks left in National Poetry Month!